At 338, Belvédère Nord - The bière dépôt (and not corner store, watch out) Au Vent du Nord is the safe for the hops fans! The team of the owner, Nicolas Ratthé, will be able to inform your choices, whether you are a novice or a connoisseur, while making several services that you won't find in your corner store available. For example, tastings where you are offered a beers/bites match take place every two Sundays all year long. It is also possible to export these tastings at home or at work, or even to organize happy hours in concert with Au Vent du Nord. 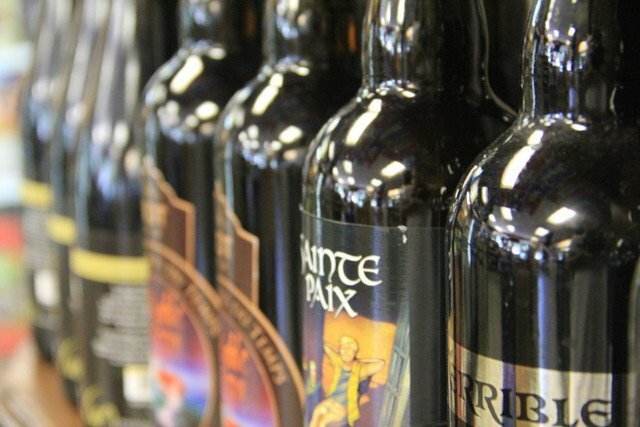 Among the various products offered, bottled nectars from the Boquébière (which even brewed a beer to honor the Au Vent du Nord establishment) and those from the Lion pub can be found. SherBroue invites you to discover local beers. The group puts into practice his knowledge in the fields of chemical, biotechnological, mechanical,computer science, and electrical engineering in the production of some of those beers. Picture: Let's brew our genious!